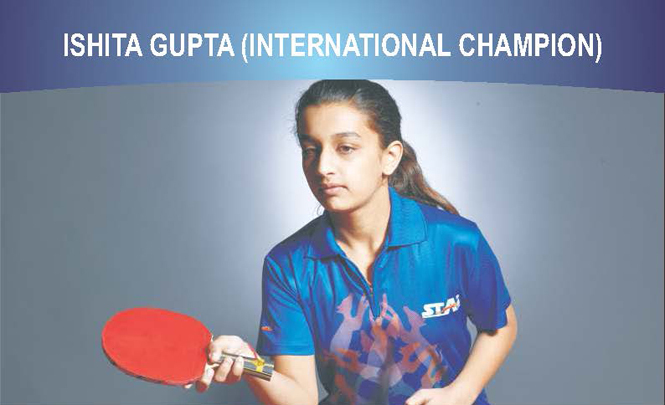 • Won Gold Medal ITTF World junior circuit India junior & cadet open held at Indore from 7th -11th September 2016. • Won Silver Medal ITTF World junior circuit india junior & cadet open held at Indore from 7th -11th September ,2016. • Secured 7th position in Team Category in Asian junior Sports exchange games ,2016 held at Tokyo (Japan) from 28th – 30th August,2016. • Secured 5th position in World school Championship 2016 (Israel) held from 2nd- 8th April,2016. • Participated in Asia Junior Sports Exchange Games 2015 held at Tokyo, Japan in August 2015. • Silver Medal in team event in 62nd national school games held at Thayagraj stadium , New Delhi from 02nd -9th january 2017. • Participated in 11even Sports 78th junior and Youth National & inter state Championship held from 06th-11th january 2017. • Gold medal in team event in C.B.S.E National T.T Championship held at Vadodara , Gujurat from 24th-28th Nov. 2016. • Gold in team in IPSC held at welhams girls ,Dehradun, from 28th – 01st sept. 2016. • Silver IPSC held at welhams girls ,Dehradun, from 28th -01st sept. 2016. • Silver Medal in Sub-Junior Girls Doubles in 77th Cadet & Sub-Junior Nationals T.T Championship held at Kolkata, West Bengal, 2015. • Bronze Medal in Sub-Junior Girls Teams in 77th Cadet & Sub-Junior Nationals T.T Championship held at Kolkata, West Bengal, 2015. • Bronze Medal in Sub-Junior Girls Singles in 77th Cadet & Sub-Junior Nationals T.T Championship held at Kolkata, West Bengal, 2015. • Bronze Medal in Girls Doubles 77th Youth & Junior Nationals T.T Championship held at Dharamshala, Himachal Pradesh, 2015. • Gold Medal in Cadet Girls Singles in National Ranking T.T Championship North Zone held at Delhi, New Delhi in 2015. • Bronze Medal in Cadet Girls Singles in National Ranking T.T Championship West Zone held at Thane, Maharashtra in 2015. 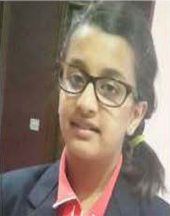 • Gold Medal in U-16 Girls Team in C.B.S.E Nationals T.T Championship held at Meerut, U.P., 2015.